There are two possibilities to park if you are coming with a car (See map below). If you go for "Parking A", you will need to pick up a (free) parking permit at our registration desk. "Parking B" are free parking spots at the "Elsässer Straße". Note that some are currently blocked due to construction. The Hackathon will take place in building 082 circled on the map in the "Kinohörsaal". We will add some signs where to go. If you can't find us just send an email or ask somebody on campus. On Saturday and on Sunday the main entrance will be closed and we will use the side entrance. The registration desk is also in building 082 in the "Kinohörsaal" at the entrance. The talks will be in building 101 in lecture hall 00 026 on the ground floor. HacFreiburg is Freiburg's Haskell Hackathon, where Haskell programmers from all around the world meet in Freiburg, Germany, to discuss, hack together and improve the Haskell infrastructure. We welcome all programmers interested in Haskell, beginners and experts! The Haskell Hackathon in Freiburg is part of the "Sommercampus 2017", organized by the Faculty of Engineering at the University of Freiburg. 15:00 - 16:00 Talk by Mike Sperber: "(Un)teachable Haskell Moments": Haskellers write great code - elegant, intricate, composable. But how did we learn to do this? And, by extension, how should we teach others how to do the same? These are not just questions of didactics, as library design (and language design!) has a significant impact on teachability. If these issues are important to do, it helps to view the language and the code with the view of an outsider. What is elegant and natural to us, might seem unattainable to others and thus make Haskell's power baffling and unapproachable. The talk will provide an outsider's view on a small but realistic project, highlight the pitfalls dealing with Haskell on the project, and hopefully stimulate discussion. 10:00 - 11:00 Talk by Mathieu Boespflug: "Low-latency high-throughput Haskell“: Haskell has had a number of successes from its original use cases (writing compilers, DSL's, static analysis, ...) to more recent ones (web services, rule execution engines, modelling, ...). It turns out Haskell can also be turned into a very capable systems language, where consistent latency, precise resource management and high throughput are the names of the game. We'll look in more detail at a few challenges along the way to making Haskell a great systems language, and tell you how we used to build massive scale storage systems with it. 10:00 - 11:00 Talk by David Luposchainsky: "Haskell QA“: Live Session explaining test frameworks and setup, benchmarking, generating and validating documentation. 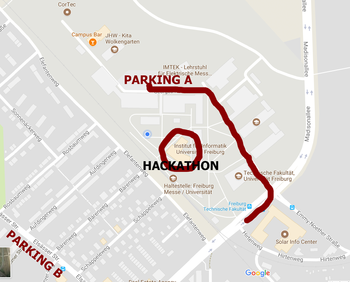 The Hackathon takes place at the Faculty of Engineering of the University of Freiburg, Germany (Map). You can reach Freiburg easily by train, car, or plane. Freiburg lies on a main train line with frequent and fast long-distance train services to major German and other European cities. For timetable information, consult the travel service of Deutsche Bahn. Freiburg is easily reachable from Frankfurt Airport (FRA), Zürich Airport (ZRH), EuroAirport Basel-Mulhouse-Freiburg (MLH, BSL, EAP), and Karlsruhe-Baden-Baden (FKB). We recommend using public transport to get from the airport to Freiburg. Frankfurt. There are hourly train connections from Frankfurt Airport to Freiburg with a direct connection every second hour. Travel time is about 2 hours. Zürich (Switzerland). There are hourly train connections from Zürich Airport to Freiburg. Travel time is slightly more than two hours. EuroAirport Basel-Mulhouse-Freiburg. Freiburger Reisedienst runs a direct bus between the airport and Freiburg train station. Travel time is about 1 hour, a one-way ticket costs about 20 € (credit cards not accepted). The same company arranges individual pick-ups from EuroAirport and other airports. Karlsruhe-Baden-Baden. To get from the airport to Baden-Baden train station, you either use a infrequently running bus (25 minutes, approx. 2 €) or you take a taxi (15 minutes, 30 €). Credit cards are usually not accepted. You reach Freiburg on Autobahn A5, exit "Freiburg Mitte". Here's a /ListOfParticipants (only those who aggreed to be listed here). And here's a /ListOfProjects collected so far. Feel free to extend or comment to list. This page was last modified on 4 August 2017, at 11:33.